Question: What are the mechanisms by which adaptive learning approaches can facilitate integrated coastal management? 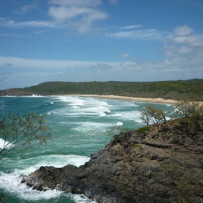 Ecological components: Australia’s coastal zone is diverse, including tropical, sub-tropical and temperate ecosystems that underpin numerous sectors such as fishing and tourism. Ecosystem services are fragile and prone to a range of pressures such as climate change (eg. changing ocean temperatures and impacts from extreme events) and resource use (eg. tourism). The coastal zone is a contested space with contested conceptions of ecosystem processes, benefits and priorities. Institutions: Australian coastal management is fragmented between scales of governance and multiple jurisdictions. More integrated institutional responses are being focused through adaptive learning. Practice and facilitation: Collective governance arrangements are being driven by collaborative partnerships between various agencies and actors (eg. local community groups) with a focus on adaptive management.